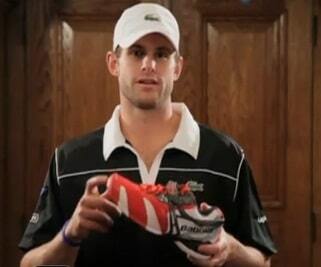 As you can see by the picture to the left, top ranked American, Andy Roddick is displaying a new tennis shoe from Babolat. He is introducing the new 2011 Babolat Propulse 3 tennis shoe. We could not find much information on the shoe, however; this is what we got from what we did find; the tennis shoe comes in 3 styles (Propulse 3…3 styles, coincidence? ), Clay (red, white, black), White (hard court), and a lady version. Babolat has also listed 5 technologies within the tennis shoe as a selling point; “Exact” – The Shoe Propulser – for a faster, more precise, and more efficient footwork. Also includes the standard Michelin rubber sole (6 month warranty we bet). The tennis shoe also includes “OCS” (Optimized Cell System) which will help the tennis player with more traction durability. One of the new Babolat technologies that is being presented is “KS” (Kompressor System), which allows for long lasting heel cushioning and comfort, TPR Tubes (eh?) which give energy dispersion, shock absorption, and more Dynamism (great energy, force, or power; vigor). Another neat feature of the Propulse 3 tennis shoe is the “Shell Shield” in the toe, which gives the tennis player more softness in the toe without sacrificing durability for the toe dragger. One of the more interesting aspects of the shoe is the strapping system, the Propulse 3 comes with a heel strap and a 360 foot strap. The combination of the two straps allows maximum comfort within the tennis shoe that is fully customizable.